Fathers’ day is coming up soon! While ties, socks, and sports equipment are the things people think of first, they may be overused. This may be a sexist view of things, but the dads we know like tools, and things to do with the garage or the car. The garage, shop, or tool area is one of the areas in the home that gets the least cleaning & organizing attention. After all, we don’t invite guests there, or sit in there to relax. If you’re short of cash, how about offering a couple of hours to help dad with that as your gift? Sort and clean the tools. Maybe they need a little wipe-down or polish to get the rust off. Don’t throw anything out without his permission, but if he agrees, sort through the collection of nails and screws as well, tossing the rusty ones. (You may need to wear gloves to protect yourself.) 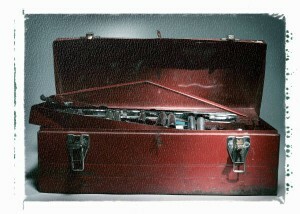 Wipe out the tool boxes; they collect an amazing amount of dust, grease, and who-knows-what. Wipe down counters and cupboards, and sweep floors. If there is a pegboard, drawers, shelves, or cupboards, make sure everything is put away in a tidy fashion. If you have some t-shirts ready for throwing out, how about cutting them up for nice soft rags for the workshop? A clean and organized workspace is more pleasant for everyone to work in, and more repairs and creative projects may happen as a result! This entry was posted in Garage and tagged garage, organize. Bookmark the permalink.